At Stanford, our role is that of students and, generally speaking, we should be students first. We have been given the precious opportunity to learn in this place, and in turn we are justly responsible for observing a regular and punctual attendance to the classes in which we enroll. It is a rare event indeed in the course of American life that something should come about such that our responsibilities as students must be, if momentarily, subordinated to our responsibilities as citizens. For me, yesterday, Wednesday, March 14, 2018, was such a moment. I left class early to attend the “Stanford Says Enough” protest on gun violence, held outside Green Library from 10:00 to 10:17 a.m. this morning. I’ve never missed class to attend a protest before at Stanford and, as a senior, I doubt I will again. This is a moment in American life that justifies both the decision by students to break the rules of attendance, and by universities temporarily to waive the associated punishments, for current and prospective students alike. Permit me to explain something. I was a student at Sandy Hook Elementary School from kindergarten through fourth grade. My old school’s motto is something I will never be able to forget. Just inside the front door, the words “All Children Can And Will Learn” stood emblazoned above the school’s logo, a green-and-blue earth surrounded by a chain of human figures holding hands. All of this was demolished along with the school in 2013. My family had always found this motto to be somewhat menacing, but in recent years I have thought of it less as a threat and more as a hope that vanished, along with the world that existed before December 14, 2012. I have not made a show of this part of my personal history in the past because I despise the cheapness with which people often feign sympathy, ask prying questions, or speak with easy confidence of this or that measure which, they seem sure, would have prevented the tragedy. I have been very careful in the past not to use my connection to these events for my own purposes, out of respect for the victims and their relatives. Here, out of the same respect, I have attempted to speak only for myself. Since 2012 I have lived with fear and sorrow in my own country. Sitting in lecture halls I fear the entrance of someone with a gun. Would I survive if I ducked in time, crawled under the seats, played dead? Would others? Some have presented me with numbers to show the unlikeliness of such an event, but these appeals have never succeeded in banishing even for a time the unshakable awareness of that terrible possibility: the arrival of violent, senseless death on our university campus. Neither do these numbers counter the knowledge that if such a horrible event happened here, likely nothing would change so that it could not happen again. I live in sorrow because those who hold power are resolute that the maintenance of personal freedom must imply a disregard for the awful slaughter of children, those whom we cherish most in our society. Note that I am pragmatic on this issue. I recognize that Americans have long maintained a stronger program of personal rights to secure individuals from the overreach of government, than have nations like Australia or Britain, and that we must act in keeping with that history and with those rights. I admit more stringent regulations will, to some degree, reduce the extent to which people may exercise a right enshrined in the Constitution. But that interference is constitutional, it will be minimized, and it can be justified in the name of the preservation of other rights — to life, to safety. Nature has invested these rights in the people, and finally it is the people, not an oligarchical club, who must decide how best to preserve them through law. Claims to individual right should not entitle groups to exercise a tyranny over American law and life, any more than should claims to divine right. The prospect of introducing more weapons of death into places that should be peaceful havens for young people to learn makes me sick at heart. Though in some sense it may be free, such a society is not just, and I cannot abide it. I felt a personal responsibility to be present at this event, to demonstrate to myself and to others this fear and this sorrow. I did not agree with everything that was said there. One speaker suggested a culture of “toxic masculinity,” not lax gun regulations, was to blame for the Parkland shooting. This struck me as both reductive and insensitive. I did not immediately understand why the majority of the speakers were drawn from the leadership of religious and ethnic student groups, rather than from the ranks of those most directly affected by gun violence in schools — or why several speeches seemed to direct attention away from schoolchildren. Still, I am glad that I attended. I shed tears as a Stoneman Douglas alumnus spoke about wanting freedom from fear, and while a student from San Bernardino described how having one’s own community affected, one’s own friends and relatives harmed, jars us out of the complacency it is so easy otherwise to maintain. 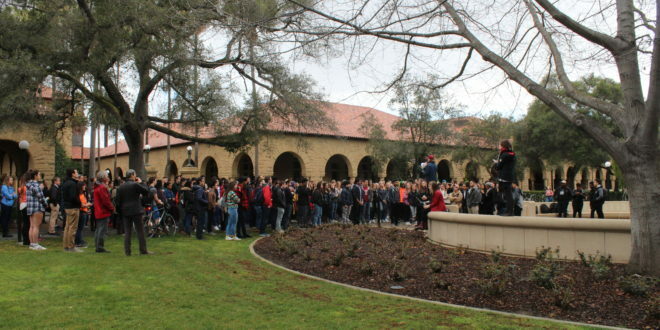 A few Stanford Review writers recently decried as political Stanford’s decision to disregard any punishments prospective students might incur while protesting for gun policy change. They suggested Stanford’s leniency was uneven and would cause a lapse in academic discipline. I do agree that students owe responsibility to their schools. Prospective and current Stanford students must realize that it is up to the university to decide what fate they will suffer if they forgo their academic commitments to make political gestures and actions on behalf of causes they find just. But Stanford’s decision not to punish these prospective students for their actions was the university’s choice to make, and it was the right choice. The students this university will soon admit are, on the whole, driven, principled, and law-abiding. They will not abuse the leniency the university has shown them by neglecting their studies. Most of them, I suspect, were prepared in advance to accept the consequences from their current and future schools. It is proper that Stanford single out this cause over others in its leniency. There is no issue so immediate and particular to the lives of young students, none so timely, and — I admit — none that I share so strongly with them. Their anger, their fear, their sorrow are all righteous in my eyes. They share my hope, the hope of Sandy Hook Elementary: that we will all one day live in an America where, free from fear and sorrow, all children can and will learn.